The frenzy that wreaked havoc and high decibel squeals in the city this week, at the Hordern Pavilion and at the Logies aka One Direction has infected our home. Four girls all humming the same song over and over again, watching the same videos over and over again. It’s the One Direction infection! So my teenager says. Hubby is a saint for putting up with all these, listening to the squeals and excitement. Yep. One can get drawn to boy bands in their time. As we had afternoon tea over these lovely rolls on Sunday, the grown ups were also reminiscing about the boy bands in our day but can’t seem to pinpoint anything that fell into the category of “boy band”. Growing up watching MTV singing, dancing and sometimes swooning over members of Spandau Ballet, Duran Duran, Culture Club, Flock of Seagulls, The Cars, Earth Wind and Fire, Dire Straits, Chicago, U2 and the list goes on. All seem to be composed of mature “men” not “boys”. The late 80s to 90s was the era when the “boy” bands emerged: Boy Zone, Boys to Men, Backstreet Boys, InSync, etc. All good fun remembering that yeah, once upon a time, admittedly, we were also drawn to the pop sensations and culture. So I say to my girls – I love One Direction too! Lol! Now back to the order of the day – this month’s Lemon theme at the Sweet Adventures Blog Hop hosted by Le Delicieux. These rolls are a cross between Flo Brakers Lemon Scented Pull-Apart Coffee Cake (featured in The Kitchn 2010 and Leite’s Culinaria in 2009) and a cinnamon roll recipe which is our favourite because its no-fuss adapted from What’s Cooking America! Ingredient quantities and some methods were revised to suit the size of the dough and the end product. We’ve made other lemon sweet treats before like this super moist Lemon Yoghurt Cake and the best ever Lemon and Passionfruit Cheesecake but never this. A sweet yeasted bread/roll with the aroma of sweet lemony goodness. Although I’m not a fan of lemony things, admittedly, this is one of those that just breaks through. A warm welcome surprise! Makes you fuzzy all over while you’re singing to your fave pop tune! 1. Heat the water in the microwave for one minute. 2. In the bowl of a stand mixer with the dough hook attachment, combine all ingredients in order listed above. 3. Mix together until the mixture forms a soft dough and moist (but not too wet. If too wet, add a tablespoon of flour until you get the desired texture and feel). 4. Lightly oil / spray your work surface and prepare about a cup of flour in a bowl for working the dough. 5. Turn the dough onto the surface and knead until elastic, approximately 10 minutes. 6. Return the dough into the bowl, cover with cling wrap and a tea towel and prove/rest until double in size, 1-2 hours (or more depending on weather conditions). 7. Butter or lightly oil a 9 x 13 x 2in baking pan. Set aside. 8. Prepare the sweet lemon paste filling. 9. After the dough has risen, turn it onto your work bench and using a rolling pin, stretch to about a 15x24 inch rectangle. 10. Using a silicon brush or rubber spatula, spread the lemon paste filling onto the dough until its all covered. 11. Roll the dough from the top going towards you, gently. 12. Pinch the seams to seal the dough edges. 13. Using a dough cutter or a sharp knife, cut the rolls into half first. then cut into equal rolls about 4 cm (or 1 and 1/2 inch). 14. Place the rolls cut side up in a prepared pan (12 rolls fit into the 9 x 13 pan, but I had to prepare a smaller one which was a test batch into a smaller pan 5 small pieces). 15. Cover with cling wrap and tea towel let rise until doubled in size (1 - 1.5hours). 16. Preheat oven to 170 degrees C.
17. Prepare the cream cheese frosting. 19. Place the pan onto a cooling rack. After 5 minutes, take the rolls out of the pan by placing baking paper on top then turning them onto the cooling rack. 20. Generously spread the cream cheese frosting on the rolls. Serve warm. Roll the dough into a rectangle, spread the lemon-sugar paste filling, roll into a log and pinch the seals. Cut into 1 and 1/2 inch thick rolls, place in pan and let rise. In a medium sized bowl, combine all ingredients for the paste and set aside. (Flo Braker's recipe for the pull apart bread was to combine all except butter. The butter used to spread on the dough, then the lemon sugar sprinkled on top. I thought combining everything in a bowl, then spreading on the dough would work just the same). Fresh out of the oven. Golden rolls. In a bowl using a whisk or a hand held mixer, whip the ingredients together until smooth. Set aside. * I've baked the test batch on the night the dough was rolled and cut (the smaller pan the photo). * The 9 x 13 pan with the 12 rolls I've refrigerated after proving. The next day, I let the the dough rest for more than an hour to let them come to room temperature before baking them in a preheated oven. Fresh out of the oven! Can you smell them? They smell so sweet and delicious! And the bread super soft. Best served fresh from the oven, slathered with the cream cheese frosting with a nice cup of tea or coffee. Or reheated for a few seconds in the microwave the next day. But I’m sure that’s hardly ever going to happen. Spread with some lemony cream cheese frosting. Love! So tell me honestly, did you also have pop group/boy band infection in your day? And have you heard of/remember the Puerto Rican boy band Menudo? Remember little Ricky Martin? Ok, I’ll stop right there. But while you're thinking about your fave pop group/boy band, why don't you hop on down and browse at all the other delicious lemony goodness below. 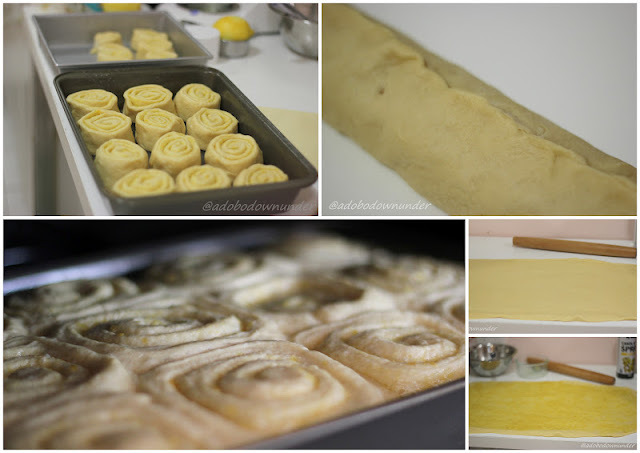 Your lemon scented rolls look divine! I'd prefer these over a cinnamon version any day. Thanks for joining us in this blog hop event. I hope you will join us again next month. I love yeast rolls and your lemon version looks delicious! The rolls are so golden and pretty with the lemony frosting. Oh how lovely... I love yeast rolls too and your photos are so vibrant! These look good, but I feel they might go against my mixing sweet and savoury food rules, so I'm not sure I'd be brave enough to try! I am happy to confess I had my fair share of teenage boy band obsessions, starting with New Kids on the Block and swiftly moving onto East 17, but I'm not sure East 17 made it down under! Thanks Nic! Thanks for the lovely comment. And yes, I do remember the now famous Marky Mark :D All good fun. Thanks for the lovely comments Erin! And yeah, all the stuff my kids go through today makes me reminisce of "those days". a lemon twist on cinnamon rolls - inspired!! What a great idea, and they look gorgeous :) I have to say, growing up smack in the middle of the boy band craze I was never a big NKOTB (etc etc) fan - the screaming girls always made me giggle just a bit! These look gorgeous! I can just imagine how good these would taste. And I love the texture of these types of rolls. Yum! Thanks for lovely words Christina! Thanks Mel B! Let me know how it turns out. I've included the links to where the recipes were adapted from. oooohhh I can smell these coming out of the oven...yum! sheepishly puts hand up to owning a New Kids on the Block record...actually I think it was the first record I ever bought! Nic, I remember East 17! Must be showing my age because I couldn't even hum a single bar of a New Direction song! whoah look at the detail of the swirls on that roll! great work!